The timing of my present reading of William Dalrymple’s extraordinary work; “The Last Mughal” could not have been more perfect. The book is a definitive account of the tragic end of the Great Mughal Empire and how the British supremacy established its firm hold in India by ruthlessly crushing the uprising of 1857 (The nationalists call it The First War of Indian Independence but the British call it Sepoy Mutiny). Exactly 150 years later (the revolt started in May 1857), Vijay Mallya, an ambitious and corporate king symbolically avenged the crushing of Indian Nationalists, as his “East India Company” took total control of 163 year old Whyte & Mackay. W&M was established around the same period when both Bahadur Shah Zafar (The Last Mughal Emperor) and Sir Charles Metcalfe, the British “Resident” were at their zenith. I am not sure whether Mallya timed this with intention, but the effect of this coincidence is far too interesting to be ignored by a student of Indian history. With this acquisition, Mallya has closed on Diageo, the world’s no.1 liquor company and the later has some work to do to maintain its no.1 position. As a 28 year old, Vijay Mallya (Vijay meaning victory), was catapulted into the already established family business when his father Vittal Mallya died suddenly in 1983. The father had set up several business units for his son although no unit was doing any remarkable business at that time. It was said that Vittal Mallya dealt in no less than 60 different products and Kingfisher beer, the bread and butter of the group was second to Mohan Meakin’s Golden Eagle in all India sales. 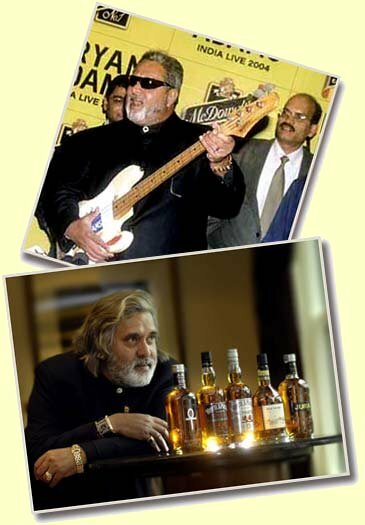 Combining an astute business mind with a fair degree of brashness, Vijay Mallya focused soon on a handful of units and quickly realized that his real profits were hidden in the growth of alcohol business in India. He streamlined all the IMFL (Indian Made Foreign Liquor) products and separately launched promotional and publicity campaigns for Kingfisher beer. Soon Kingfisher became a pub-hold name in India and the “King of good times” had arrived. Within a short span of time, Vijay Mallya associated himself and his products with horse racing, fashion, sports, sailing and did anything to catch the eye of the media. In 2005 he launched Kingfisher Airlines – the logo and the name lending a very effective surrogate advertisement to its beer brand (direct beer and liquor advertisements are banned in India). Vijay Mallya’s brashness led him to several controversies and his take over of Shaw Wallace and confrontations with Manu Chhabria are well known to India’s corporate world. Added to this, he got entangled in criminal case under (the then) notorious Foreign Exchange Regulation Act (FERA) and came out clean only recently. Vijay Mallya realized that to become an extraordinary successful businessman in India (and that too in liquor industry); he needs to be in the close quarters of New Delhi. With this in mind he entered politics in 2000 and soon became a Member of Parliament in 2002. Liquor laws, its taxes and duties in India are very complex and are subject to both central and individual state laws. To protect the local liquor industry, Vijay leant his wholehearted support to the Government’s policy of extremely high import tariffs even though they were against the WTO guidelines. It is another matter that in the process he became a hated figure with SWA. The astute mind knew that as long as he is tagged as a local liquor baron and sided with the government, the import duties would never be brought down by Government of India. He disparately needed real and readily available stocks of alcohol and started looking towards Scotland and at W&M in particular. For time being, he flirted with the idea of buying whole of France’s Taittinger, but withdrew in the last moment for strategic reasons but not without grabbing a part of Taittinger’s Bouvet Ladubay for USD 15 million. Now that the deal is through, Vijay Mallya, as owner of Scottish Distilleries has to make amends with the SWA (or the other way round?). He also has to influence the Government to reduce duties to enable him to import his freshly acquired Scotch into India. Gavin Hewitt, the Chairman of SWA is as usual and typical of his comments “….he will not be given a free ride and he will have to commit to a certain code, besides the articles of association”. Mr. Hewitt appears to be naïve; once Vijay is in SWA club, his charm would work through, influencing the right quarters and even mending of the articles of association of SWA. In fact, I am afraid, with Vijay Mallya in SWA, the very definition of whisky as per European Standards might under go change. As for import duties on Scotch, I am sure that some body is working hard in the Central Government quarters to reduce the duties as are some babus in individual state governments. In fact the government would have liked the deal to have been concluded by February 28, 2007, the day when the Union Budget was presented. The reduction of duties not only would help Vijay Mallya but also would make other Scottish whisky companies, who hitherto have been waiting impatiently for a very long time to sell their scotch to Indians happy. The United Spirit’s exports of blended whiskies to Russia and China are just round the corner or might have just commenced.